Whitewater Shopping Centre is holding a series of events throughout April, with expert advice on how to look good and feel great for your age and body shape. The Age of Elegance campaign is aimed at women over 40 and features Beauty Booths (13th & 20th April), Style Workshops (13th & 20th April) and one-on-one personal shopping sessions, with stylist Jules Fallon (on the 18th, 19th, 25th & 26th April). 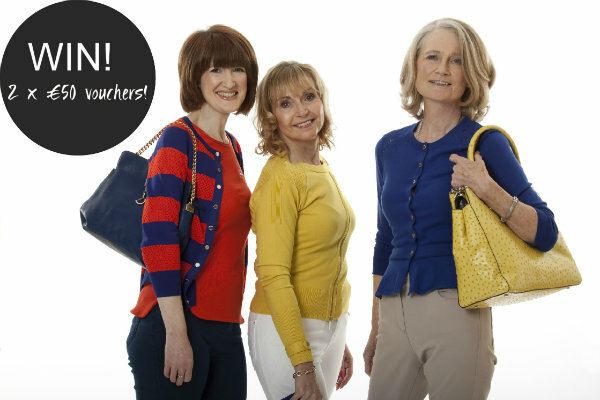 To launch the campaign, 1st Options models scouted for three stylish ladies of all shapes and sizes over 40, to be the face of Whitewater Shopping Centre’s Spring/Summer campaign. The selected women (pictured above) will also walk the catwalk with Jules Fallon on April 13th. If you’re over 40, or you’re close to someone who is – that could be your best pal, sister, mother or aunt - why not visit the Kildare shopping centre to check it out. And here’s a little incentive for you – two lucky readers of Fluff and Fripperies will each win a €50 voucher to spend at Whitewater. You must be resident in Ireland and follow the simple steps in the widget below. Best of luck everyone! The food section right now lol! Love the Whitewater, easier than trekking to Dublin when you have small kids. All it's missing is Next. Another great comp, thanks Emma, i like that it's for Whitewater, more doable for us lot in the midlands, i also like it's underground carpark! It's so great when real people are used in these campaigns. Classic Trench coat Giveaway on my blog! What beautiful women...sounds like an amazing campaign! If you have a chance, I would love for you to stop by my blog and check out my latest post...and stay tuned for tomorrow's giveaway! Have a great day. Please coount me in I'd love to win. That's a very nice event! Would love to be one of your lucky winners. Fingers crossed and here's a wishing. Love that they're using normal real women. Great idea. I love whitewater shopping centre. Great comp, Whitewater has some great shops and a GBK! fab. I love Whitewater, i'm addicted to the place - i must stay away!! This is a really great giveaway, I'd love to take my mam there, I don't think she has ever been. Great idea...real women modelling affordable fashion! That is such a great idea, fair play to the White water! The Whitewater is great, I'd love this! I almost missed this! Thanks for the FB reminder post!